Build a Personal Brand, and Take Charge Of Your Career. 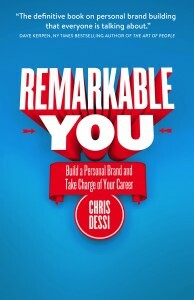 Based on the Personal Branding Book: Remarkable You: Build a Personal Brand, and Take Charge of Your Career. Personal branding expert, and success speaker Chris Dessi will share the proper path to thought leadership in a digital age. How to define your message? How to determine your audience? How to define where do you want to publish your content? How to proactively engage and build your platform.